Previously mistaken for a black hole, one of the two Ultraluminous X-ray Sources (or ULX- an object that produces unusually large amounts of X-rays within a binary star system) pictured in this galaxy is actually the brightest pulsar ever discovered. Located nearly 11 million light-years from Earth, M82 has one ULX typical of its kind, a black hole sucking matter inward and releasing bright X-ray emission as a result. ULXs range from masses 10 to 100 times that of our own Sun. Using NASA’s NuSTAR (Nuclear Spectroscopic Telescope Array), Chandra X-ray Observatory, and the NOAO (National Optical Astronomy Observatory) 2.1 Meter Telescope, astronomers formulated a composite image of X-ray data from M82 (blue=Chandra, purple=NuSTAR, gold=NOAO). 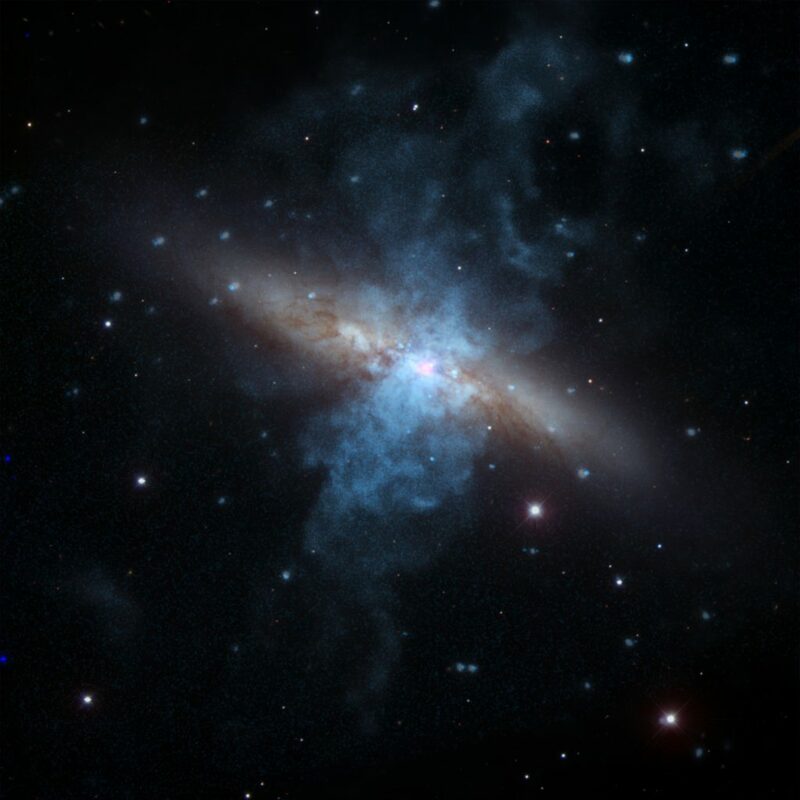 While studying the galaxy with NuSTAR, strange pulsations were detected in M82X-2: one of the two ULXs in M82. Black holes do not emit such pulses, rather pulsars-rapidly rotating neutron stars. When at its brightest, M82X-2 is ten times more luminous than any known pulsar fueled from a companion star’s material.